Are AI composers the future of music? Ecrett Music is an AI-powered tool that generates unique music soundtracks for videos. Its creations are royalty free and sound surprisingly natural, and access to the tool costs just a few dollars a month. It's a boon for YouTubers, but it's also slightly unsettling – art is supposed to be the realm where human ingenuity wins out over machine efficiency. Could Ecrett Music, through its affordability and convenience, put composers of incidental music out of work? “I believe that AI will help human musicians, not put them out of work,” says Ecrett Music's founder, Daigo Kusunoki. “We don’t have to be afraid of AI taking our job, what’s important is to figure out how to take advantage of AI’s capabilities and use them to enhance our own creativity." It's a valid point; AIs have been lending musicians a hand since 1995, when David Bowie used an application called The Verbasizer to pull sentence fragments from stories and articles, and slam them together to create unexpected lyrics. Kusonoki has loved music since he was a child. He took up guitar in junior high school, and began dancing at university. He also enjoys creating things, and says his dream has always been to combine those two passions by creating something related to music. His first foray into music tech was the SoundMoovz wearable. “Users can wear it on wrist or ankle, assign sounds through the app, and create a series of sounds by moving,” he explains. From there, he began to consider other ways non-musicians could create their own songs. “Since SoundMoovz was rather like an instrument gadget, I wanted to develop a tool that allows everyone to compose music intuitively,” he says. Ecrett Music works entirely in your web browser. Just visit the site, select the type of content (options include workout, party, travel, relaxing, cooking and fashion), pick a mood (happy, chill, sad, exciting or serious) and choose how long you want the piece to be. You can also upload your video to preview how the music and visuals will work together. The system will then generate a clip for you. If you like, you can edit the structure of the composition to better fit your video, and change the bass, drums, melody and backing. It’s all very simple, and requires no knowledge of music theory. When you’re happy with the result, click ‘Download’, create an account, and choose which membership tier suits you best. There are two membership tiers available, both of which are fine for commercial use. Standard membership costs $5 (about £4, AU$7) per month, and offers unlimited creation and downloads for teams of up to nine people. For businesses with 10 people or more, there’s the Pro plan, which comes in at $9.99 (about £8, AU$14) per month. There’s a small discount if you choose to pay annually rather than monthly. All tracks generated by Ecrett are royalty free, so there’s no charge for using them in personal or commercial work, and no credits are required (though a link to the site is appreciated). The only thing you’re not allowed to do it resell, sublicense, or redistribute the music yourself. Kusonoki says early reactions to Ecrett Music (which came out of beta last week) have been overwhelmingly positive, with filmmakers praising its speed and convenience. However, early users have also requested extra 'scene' and 'mood' options – which will only be possible with extra work from the human creatives. Any AI application is only as good as the data it's given to work with. In the case of Ecrett, this was provided by a team of six people, including a director, software and AI engineers, designers and composers. “One of the biggest challenges so far was to improve the AI technology because there is no concrete definition of what makes the music emotional and human-like. We are still trying various methods to improve the AI," Kusonoki says. 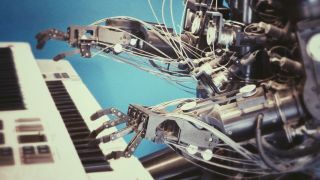 While AI-powered composers can be useful tools, it doesn't look like Ecrett will be putting human composers of incidental music out of a job any time soon.